The Champagne Stakes is the third and final Group 1 for two-year-olds during the Sydney Autumn Carnival. A field of 12 will line up in the $500,000 co-feature at Randwick and we have free tips, form and odds on offer. Not paying each-way odds but he is the second-best horse in this race and is worth backing. Richard Litt lines up the two-year-old which scored two upset wins to start his career before running on nicely at his last two starts. The mile was always going to help and it will give him time to fully wind up and let down in the Randwick straight. Fiorente colt which comes into this having won the Fernhill Stakes last start at Randwick. 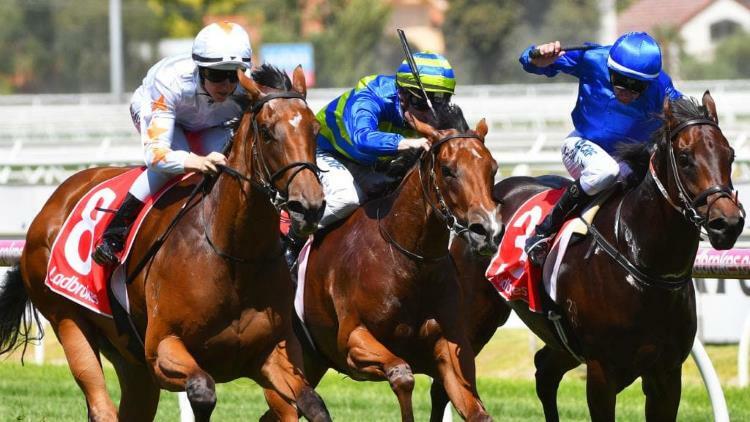 The Lindsay Park-trained runner scored a narrow win and that could hold him in good stead for this. His form prior was a touch suspect, however, but treat with caution and be weary of any betting moves. Slightly too short in the betting at the moment for our liking. Seventh behind Power Scheme in the Fernhill and we’re not sure that’s going to be the best form guide for the Champagne Stakes. Tony McEvoy has a good record in juvenile races but his two wins to date have come at Mornington and Gawler. This is some rise in class and he looks held. Drawing wide won’t help but Hugh Bowman rides. Another runner which is slightly shorter in the betting than we expected, but he has good form to date. The Sebring colt scored wins at Wyong and Newcastle to kick off his career before running third behind Bellevue Hill in the Baillieu Stakes at Rosehill. That wasn’t an overly impressive form race and his trial since has only fair. We would need better odds to take the risk. Fell in the Fernhil and his form prior to that wasn’t any good. Falling won’t do his confidence any help and we can’t have him in our selections. Yet to do much in three starts and bookmakers look to have his odds spot on here. Likely to start at triple-figure odds. Yet to finish within six lengths of the winner. Another runner which fell in the Fernhill Stakes last time out. Ran eighth in the Baillieu prior to that and he would need to find many lengths in order to be competitive here. We’re taking a risk with this colt after he ran only fifth at Gosford in maiden grades last start but he was hitting the line nicely enough. He’s a nicely-bred son of Fastnet Rock, which is a positive and with that experience under his belt, he could score a massive upset at nice odds. She deserves a Group 1 victory and this is her best chance. She ran fourth in the Golden Slipper after travelling wide throughout before improving to run second last start. That came in the Sires’ Produce behind Microphone and she’s facing easier opposition here. Rising to the mile isn’t going to hurt her chances and she could dominate this race in the early stages. Scored an upset win over Chenier at Sandown last start but that was midweek level and Chenier is highly overrated. Still, the win was a quality outing for the Sebring filly and she scored with something in hand. Her form prior included a last-place finish behind Cheer Leader and that form hasn’t stacked up since. Yet to win a race but the rise to 1600m will suit her nicely. She’s bred to want 2000+ and she showed enough in the Sires’ Produce Stakes to warrant attention. $15 is a fair price for the John Sargent-trained filly and we wouldn’t be surprised if her first win came at Group 1 level. Broke through for the win at Hawkesbury last start but she’s going to find this much harder. The progeny of Rubick are running well at the moment and she as plenty of upside but we’re happy to leave her out of calculations.